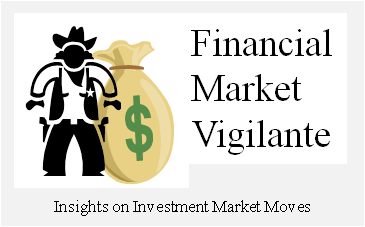 Financial Market Vigilante: New All-time S&P500 Highs - What will Derail the Stock Market Party? New All-time S&P500 Highs - What will Derail the Stock Market Party? 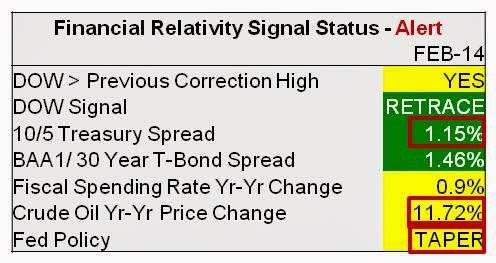 The status of the Theory of Financial Relativity leading equity market indicators as of 2/28/2014 is show in the table below. progressing into the spring of 2014 due to the unsustainable basis for the market valuation and increasing international unrest. This assessment is based on ample evidence that the primary basis for holding the record stock index highs at the end of February was a Fed driven shortage of US dollar investment alternatives. With the advent of much higher international tension, the US equity market was precariously perched for a downturn if the economic war between east and west escalated. 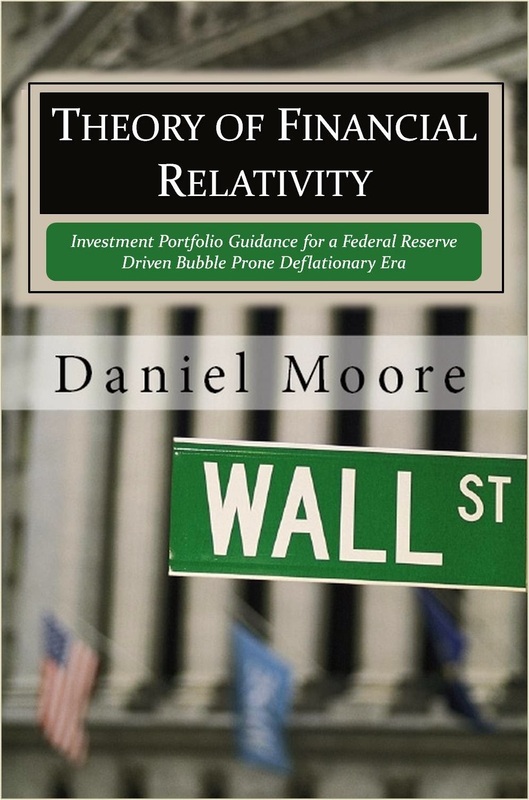 Due to continued historically high levels of quantitative easing by the U.S. Federal Reserve, the Financial Relativity Index signals were not yet indicating an imminent large scale market breakdown. Fixed income safe investment alternatives were in short supply and additionally most Treasuries were providing negative inflation adjusted returns. This market environment was not conducive to creating a sustainable run on stocks. However, the oil market, and the heavily correlated gold market were both severely undervalued relative to dollar based equity and fixed income investments. International tensions driven by Russia’s aggressive acts of war in the Ukraine buoyed increased buying activity in these markets, triggering a higher cautionary alert by the leading indicators for equity investors. The strength in the oil and gold markets relative to USD based Treasuries and equities were a direct indication of growing dollar based weakness as the international events in the Ukraine were unfolding. In addition, the safe haven Treasury trade became more pronounced as capital began to flee to Treasuries of all maturities driving down rates across the board. Should the tensions of potential war in the Ukraine continue without immediate resolution, the threat of a sustained U.S. equity market breakdown will rise. Historically when the market is ripe to roll-over, research shows that it is almost always driven by a disruption from an international source which forces the Federal Reserve to respond with tighter credit conditions to maintain the value of the U.S. dollar. The most reliable signal of deteriorating conditions that instigate Fed intervention is the oil market because it clearly shows the relative strength of the non-western alliance currencies to the USD. As of the end of February 2014, because of the weak U.S. economy, the magnitude of an oil spike required to precipitate a market downturn may not be as large as in the past. Typically a run up of 50% to 100% is required. Based on the relatively high valuation of the market at the present time, any sustained run in oil prices at the previous all-time high in the range of $140 a barrel for WTI should be viewed as a very unwelcome sign for investors with over-exposure to U.S. equities.